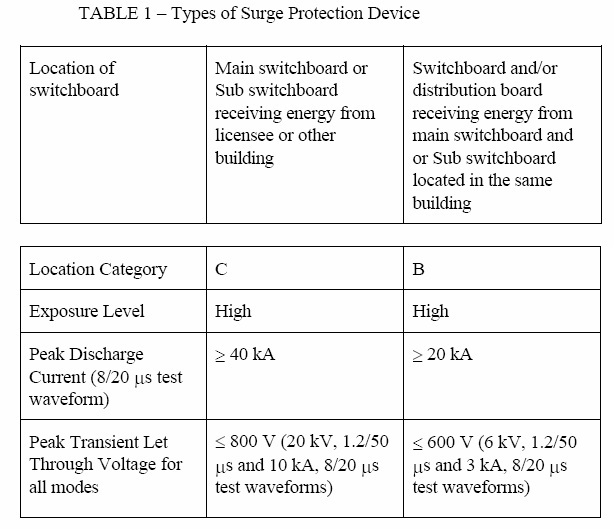 The peak transient let-through voltage or voltage protection level for all modes (phase-to-neutral, phase-to-earth and neutral-to-earth) shall be as in Table 1 above. Unless otherwise specified, the SPD shall be of the type complying with BS 6651 and/or IEC 61024-1 and IEC 61312-1. The surge protection device shall incorporate continuous indication of its protection status, viz. full protection present, reduced protection – replacement required and no protection – failure of protection. The connecting leads shall be as short as possible and not more than 1000 mm in length, and shall be tightly bound together over throughout the whole length. Unless otherwise specified, four-pole moulded case circuit breaker or fuses of rating as recommended by the SPD manufacturer shall be provided to enable full isolation of SPD from the system for maintenance. wMfVgu you might have an incredible blog here! would you like to make some invite posts on my weblog?